The Commonwealth Supreme Court. 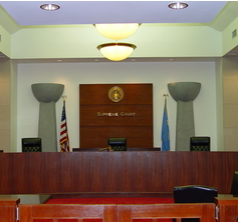 The Commonwealth supreme court shall hear appeals from final judgments and orders of the Commonwealth superior court. The supreme court shall have all inherent powers, including the power to issue all writs necessary to the complete exercise of its duties and jurisdiction under this constitution and the laws of the Commonwealth. The supreme court shall consist of a chief justice and at least two associate justices. The Legislature may increase the number of justices when necessary.